If there’s one thing better than living in a castle then surely it’s living in a Magic Castle – a place where black cats and spell books coexist with Leonora the inhabitant; it’s the basis of this online slot which comes with two separate bonus features and you can read all about it below. 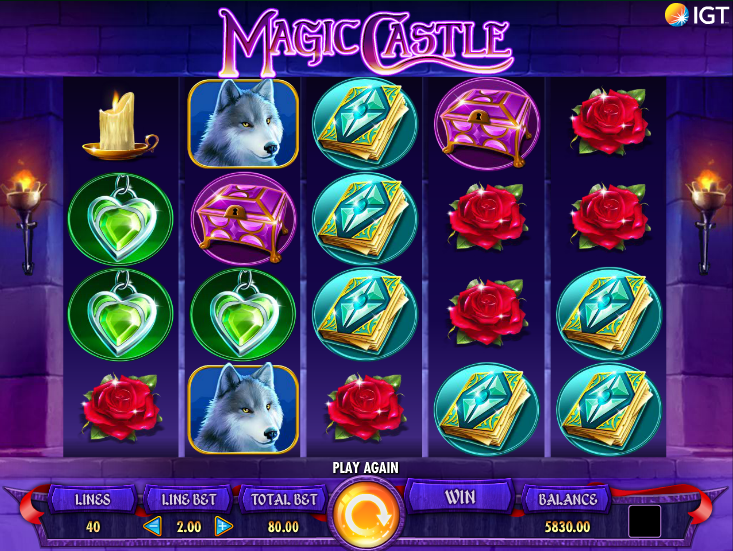 Magic Castle is a five reel slot with four rows and forty fixed paylines; the design is quite basic but the reels spin against the empty windows of the purple-hued castle while torched light the scene from either side. The high value symbols are all theme-related and include a wolf, a black cat, a spell book, a purple chest, a green locket, a red rose, a candle and a golden cup. The lady Leonora is wild and she’ll substitute for all others to form winning combos except for the castle/full moon scatter symbol. Leonora is two positions tall and if she takes part in a winning combo a random multiplier value of up to 10x will be applied to that amount. 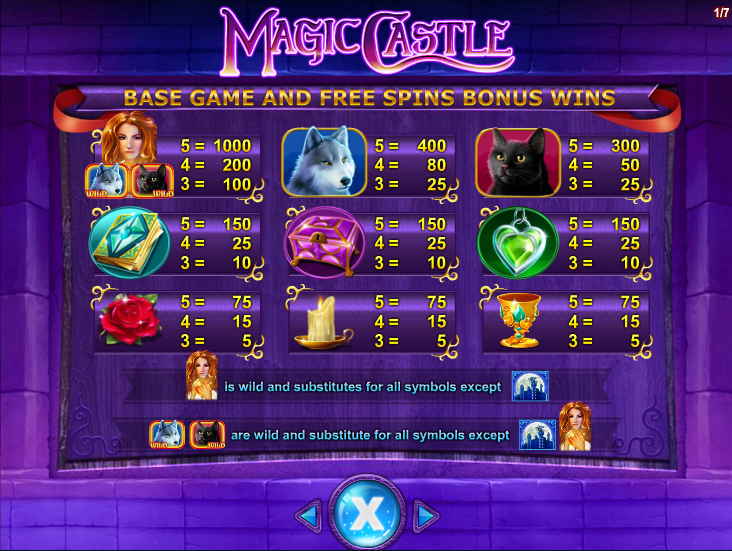 This is triggered by landing three of the castle/full moon scatter symbols anywhere on reels two, three and four; you will now receive 15 free spins although a wild symbol also appearing will multiplier the number of spins by the value which appears in her crystal ball (up to a maximum of 150 spins). Every spin will be subject to a random multiplier value of up to 10x and it’s possible to retrigger up to 300 more spins by landing more scatter symbols. If the wolf or the cat symbols land on reel five, all other matching icons on the reels become wild to hopefully help you out with a big win. The graphics are perhaps a little basic but Magic Castle is a slo which provides us with plenty of action and lots of bonus features – it comes with an RTP which ranges from 92.17% to 96.08% and is certainly worth a look.